One of the most famous attractions in Alwar, Moosi Maharani ki Chhatri is a beautiful red sandstone and white marble cenotaph of the rulers of Alwar. 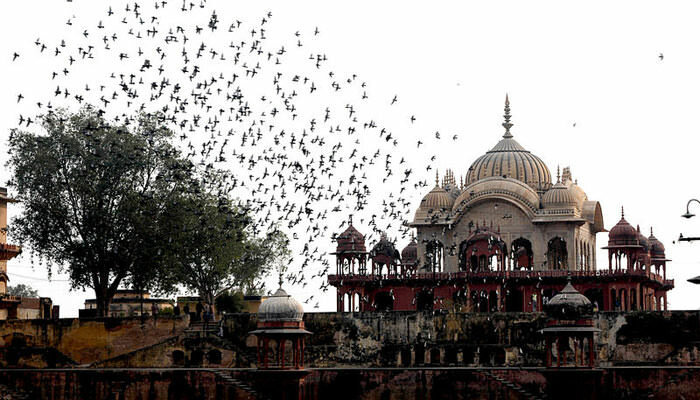 The Moosi Maharani ki Chhatri is one of the most famous monuments in Rajasthan. Built by Vinay Singh, the famous cenotaph is located just outside the city of Alwar. The Moosi Maharani ki Chhatri is one of the most famous cenotaph in Alwar. Vinay Singh built the structure in honor of the Maharaja Bakhtawar Sight and his queen Rani Moosi in 1815. The ‘Chhatri’ refers to an elevated dome-shaped pavilion, which is usually built to symbolise pride and honour in the Rajputana architecture of Rajasthan. The cenotaph is based on a pillared red stone. It is a twofold storeyed structure. The upper story gloats a brilliant architecture of marble. The insides of the structure are similarly alluring as they brag intricate carvings. There is likewise a colossal water tank found near the chhatri. The timings for Moosi Maharani ki Chhatri is from 9:00 am till 4:30 pm, and is open on all days except Fridays.